Sick of all those TV you’ve been seeing in CES that either boasts a prettier design or a bigger size or even a mind blowing 4K resolution? Well, here’s something slightly different, the World’s First Curved OLED TV from Samsung. Why curved? According to the company, a curved OLED panel provides depth to the content, giving a more life-like viewing experience. Curved OLED TV allows for an immersive panorama effect, which is not possible with flat-panel TVs. ; users will be able to feel like they are surrounded by what they’re watching. Samsung also improved the picture quality of the Curved OLED TV to deliver a more comfortable viewing experience. No further details have been revealed about the Curved OLED TV like the size or if it’ll be equipped with the company’s Smart Hub and Smart Control. Meanwhile, check out Samsung’s press event at CES 2013 in the video after the break and find out what’s new and even take a glimpse of what the Evolution Kit looks like. 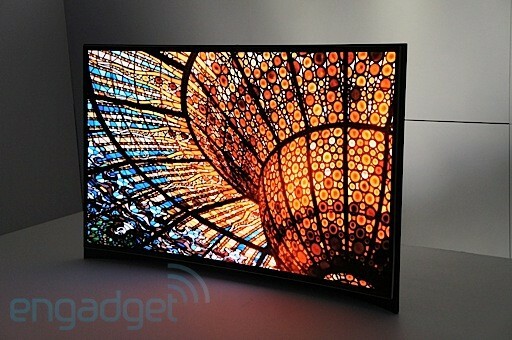 CES 2013: LG introduces "World's First" Curved 3D OLED TV...Because They Can, Too.